Jani Kilian was born in Ville Acadie, the largest city on the Commonwealth colony of Acadia. Her father Declan, a systems developer, was of Irish descent; her mother Jamira Shah, a shopkeeper, was of South Asian descent. Jani grew up speaking a French dialect, learned Commonwealth English in primary school, and decided early on that life on a backwater was not for her. She wanted to see other worlds, so like so many other colony kids, she joined the Service. 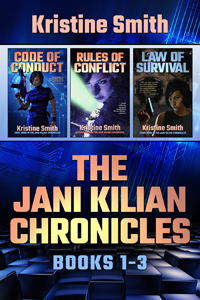 I have rereleased the first four Jani Kilian novels in ebook and trade paper POD formats. 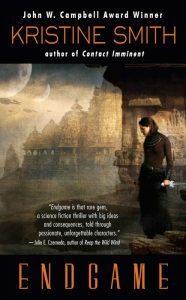 Endgame, the fifth and final book in the series, is still available in ebook and mass market editions from Harper Voyager. 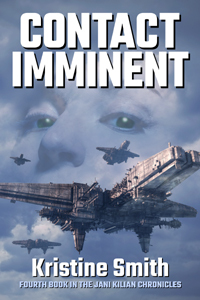 After rights reverted, I no longer had the right to use the original cover artwork. The new covers were designed by Dave Smeds. We were lucky enough to find photographs featuring a model who came pretty darned close to my idea of what Jani looked like. 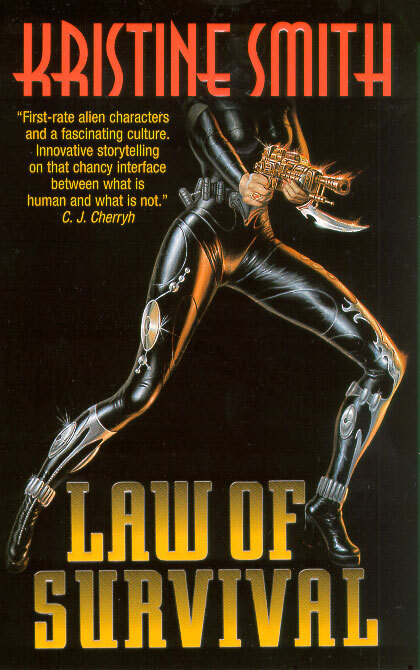 I’ve released a boxed set containing Code, Rules, and Law. Fifth book in the series. 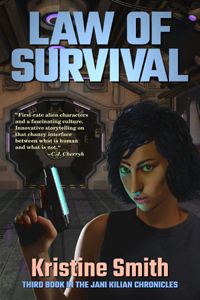 Still published by Harper Voyager. The original mass market paperbacks are still available out in the wild, either used or, in the case of Endgame, brand-spankin’-new. 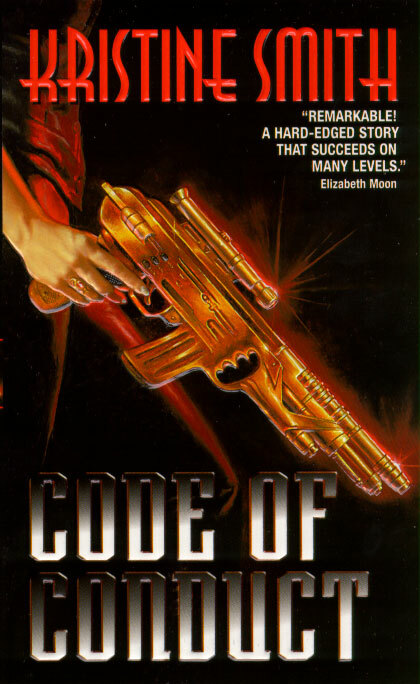 The covers of Code, Rules, Law, and Contact were by Jean-Pierre Targete. 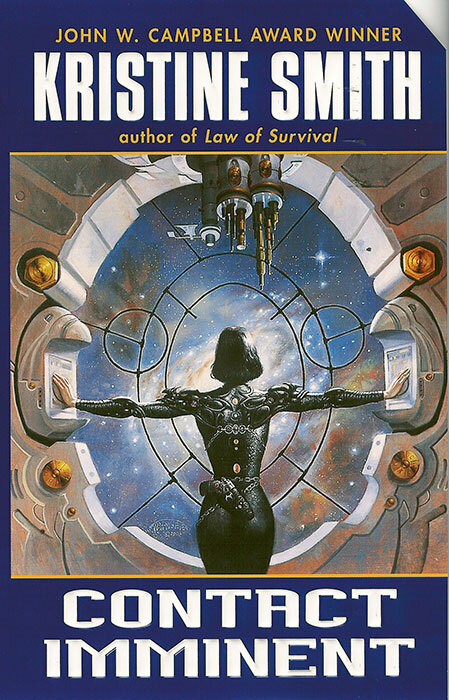 The cover of Endgame was by Chris McGrath. 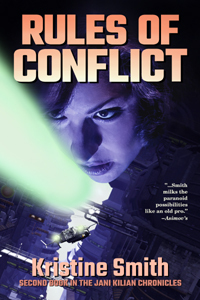 My first–and so far only– foreign sale was to the Russian publisher AST, which bought CODE OF CONDUCT. That’s my name at the top of the cover, in those cool industrial letters. I’m not sure if the bordering graphic with T. rex and the castle on the precipice is a standard AST border or part of *my* cover. No dinosaurs were harmed in the writing of any of my books, in case you wondered.I do like the transport.